Gobbetti, Marco Pontonio, Erica Filannino, Pasquale Rizzello, Carlo Giuseppe De Angelis, Maria and Di Cagno, Raffaella 2018. How to improve the gluten-free diet: The state of the art from a food science perspective. Food Research International, Vol. 110, Issue. , p. 22. Fry, L. Madden, A. M. and Fallaize, R. 2018. An investigation into the nutritional composition and cost of gluten-free versus regular food products in the UK. Journal of Human Nutrition and Dietetics, Vol. 31, Issue. 1, p. 108. Sahagún, Marta Bravo-Núñez, Ángela Báscones, Guillermo and Gómez, Manuel 2018. Influence of protein source on the characteristics of gluten-free layer cakes. LWT, Vol. 94, Issue. , p. 50. Christoph, Mary J. Larson, Nicole Hootman, Katie C. Miller, Jonathan M. and Neumark-Sztainer, Dianne 2018. Who Values Gluten-Free? Dietary Intake, Behaviors, and Sociodemographic Characteristics of Young Adults Who Value Gluten-Free Food. Journal of the Academy of Nutrition and Dietetics, Vol. 118, Issue. 8, p. 1389. Gómez, Manuel and Román, Laura 2018. Polymers for Food Applications. p. 693. Valitutti, Francesco Iorfida, Donatella Anania, Caterina Trovato, Chiara Montuori, Monica Cucchiara, Salvatore and Catassi, Carlo 2017. Cereal Consumption among Subjects with Celiac Disease: A Snapshot for Nutritional Considerations. Nutrients, Vol. 9, Issue. 4, p. 396. Barca, Ana María Calderón de la and Mejía-León, Maria Esther 2017. Celiac Disease and Non-Celiac Gluten Sensitivity. Cabrera-Chávez, Francisco Granda-Restrepo, Diana María Arámburo-Gálvez, Jesús Gilberto Franco-Aguilar, Alejandro Magaña-Ordorica, Dalia Vergara-Jiménez, Marcela de Jesús and Ontiveros, Noé 2016. Self-Reported Prevalence of Gluten-Related Disorders and Adherence to Gluten-Free Diet in Colombian Adult Population. Gastroenterology Research and Practice, Vol. 2016, Issue. , p. 1. Missbach, Benjamin Schwingshackl, Lukas Billmann, Alina Mystek, Aleksandra Hickelsberger, Melanie Bauer, Gregor and König, Jürgen 2015. Gluten-free food database: the nutritional quality and cost of packaged gluten-free foods. PeerJ, Vol. 3, Issue. , p. e1337. 1. Golley, S, Corsini, N, Topping, D, et al. (2015) Motivations for avoiding wheat consumption in Australia: results from a population survey. Public Health Nutr 18, 490–499. 2. NPD Group (2015) Percentage of U.S. Adults trying to cut down or avoid gluten in their diets reaches new high in 2013, reports NPD. https://www.npd.com/wps/portal/npd/us/news/press-releases/percentage-ofus-adults-trying-to-cut-down-or-avoid-gluten-in-their-diets-reaches-new-highin-2013-reports-npd/ (accessed July 2015). 3. Aziz, I, Branchi, F, Pearson, K, et al. (2015) A study evaluating the bidirectional relationship between inflammatory bowel disease and self-reported non-celiac gluten sensitivity. Inflamm Bowel Dis 21, 847–853. 4. De Giorgio, R, Volta, U & Gibson, PR (2015) Sensitivity to wheat, gluten and FODMAPs in IBS: facts or fiction? Gut (epublication ahead of print version 15 June 2015). 5. Wu, JH, Neal, B, Trevena, H, et al. (2015) Are gluten-free foods healthier than non-gluten-free foods? An evaluation of supermarket products in Australia. Br J Nutr 114, 448–454. 6. Catassi, C, Bai, JC, Bonaz, B, et al. (2013) Non-celiac gluten sensitivity: the new frontier of gluten related disorders. Nutrients 5, 3839–3853. 7. Gibson, PR, Varney, J, Malakar, S, et al. (2015) Food components and irritable bowel syndrome. Gastroenterology 148, 1158–1174. 8. Molina-Infante, J, Santolaria, S, Sanders, DS, et al. (2015) Systematic review: noncoeliac gluten sensitivity. Aliment Pharmacol Ther 41, 807–820. 9. Gibson, PR, Muir, JG & Newnham, ED (2015) Other dietary confounders: FODMAPS et al . Dig Dis 33, 269–276. 10. Levinovitz, A (2015) The Gluten Lie and Other Myths About What You Eat. New York: Regan Arts. 11. Pietzak, MM (2005) Follow-up of patients with celiac disease: achieving compliance with treatment. Gastroenterology 128, S135–S141. 12. Lee, AR, Ng, DL, Zivin, J, et al. (2007) Economic burden of a gluten-free diet. J Hum Nutr Diet 20, 423–430. 13. Singh, J & Whelan, K (2011) Limited availability and higher cost of gluten-free foods. J Hum Nutr Diet 24, 479–486. 14. Donini, LM, Marsili, D, Graziani, MP, Imbriale, M, et al. (2004) Orthorexia nervosa: a preliminary study with a proposal for diagnosis. Eat Weight Disord 9, 151–157. 15. Musolino, C, Warin, M, Wade, T, et al. (2015) ‘Healthy anorexia’: the complexity of care in disordered eating. Soc Sci Med 139, 18–25. 16. Patel, P, Bercik, P, Morgan, DG, et al. (2015) Irritable bowel syndrome is significantly associated with somatisation in 840 patients, which may drive bloating. Aliment Pharmacol Ther 41, 449–458. 17. Quick, VM, Byrd-Bredbenner, C & Neumark-Sztainer, D (2013) Chronic illness and disordered eating: a discussion of the literature Adv Nutr 4, 277–286. 18. 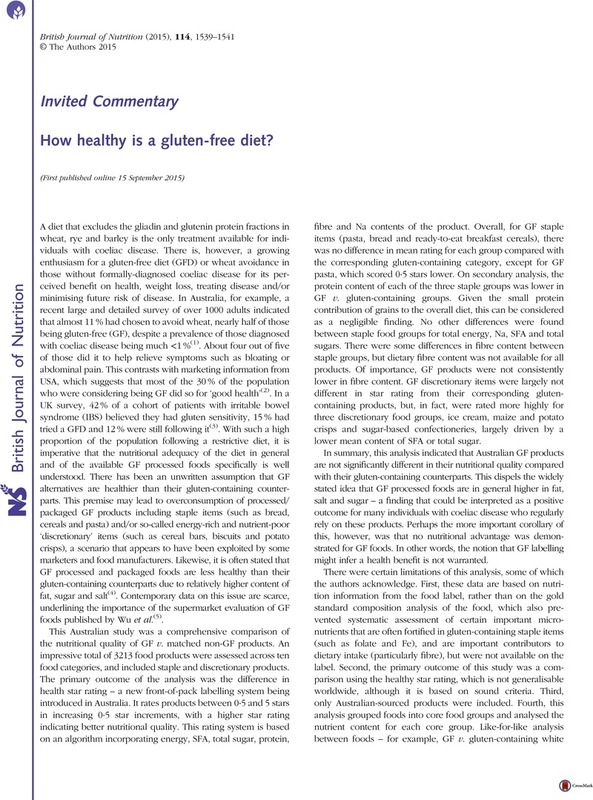 Shepherd, SJ & Gibson, PR (2013) Nutritional inadequacies of the gluten-free diet in both recently-diagnosed and long-term patients with coeliac disease. J Hum Nutr Diet 26, 349–358. 19. Wild, D, Robins, GG, Burley, VJ, et al. (2010) Evidence of high sugar intake, and low fibre and mineral intake, in the gluten-free diet. Aliment Pharmacol Ther 32, 573–581. 20. The InterAct Consortium (2015) Dietary fibre and incidence of type 2 diabetes in eight European countries: the EPIC-InterAct Study and a meta-analysis of prospective studies. Diabetologia 58, 1394–1408. 21. Tang, G, Wang, D, Long, J, et al. (2015) Meta-analysis of the association between whole grain intake and coronary heart disease risk. Am J Cardiol 115, 625–629. 22. Davis, W (2011) Wheat Belly: Lose the Wheat, Lose the Weight, and Find Your Path Back to Health. New York: Rodale.